BasicFunder has all the tools to meet your receipting needs! The software comes equipped with standard built-in receipts. You can also create your own receipt, designed to your specifications. You can email or print receipts containing one or more copies. 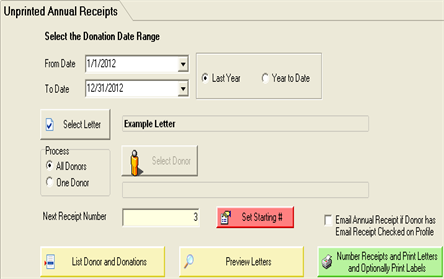 Receipts can be generated for a single donation or combined annually. You can fully customize your receipt with logos, an electronic signature, by changing the fonts and more.